The earliest castles were made from timber and earthworks, known as motte-and-bailey castles. The motte is a mound, either a convenient hill or a man-made one, with a defensive barrier and a tower (the keep) on top. The bailey is the area next to the motte enclosed by a fence and a ditch. 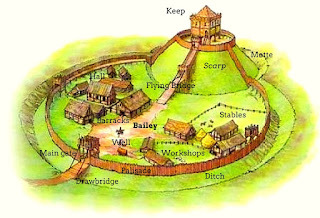 Inside the bailey were the living quarters, hall, chapel, kitchens, stables and other buildings. If the castle was attacked everyone would withdraw from the bailey into the tower on the hill, which was more easily defended. The advantages of the motte-and-bailey castle were they could be constructed quickly and easily with local material, and by unskilled labour. The Normans used them to consolidate their power after the conquest. They built almost 1000 castles in England, Scotland and Wales. There were disadvantages too. The timber would rot and be expensive to maintain, and being combustible, fire arrows and fire throwing machines could easily burn them down. Of necessity the mottes were small, making accommodation in the keep very cramped. A better solution was needed. Motte-and-bailey castles were popular for 200 years but eventually builders began to replace the timber with stone, which was stronger, more durable, and fireproof. Initially, the timber structures were rebuilt in stone, but this didn’t solve the lack of space and engineers were concerned the motte wouldn’t support the greater weight of a stone keep. This castle is called a shell keep and was not popular for long. Soon people were becoming more ambitious. Stone buildings could be built much larger and more impressive. 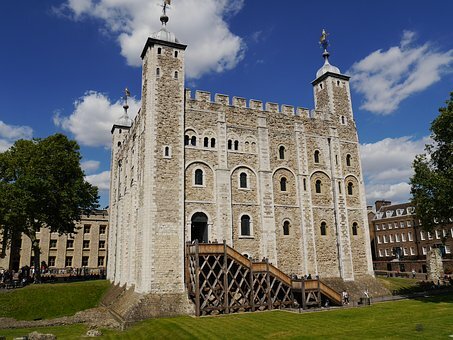 The first stone castle built in England and one of the first in Europe was the famous White Tower of the Tower of London. It was completed at the end of the 11th century, while traditional motte-and-bailey castles were still being built. Firstly, the stone buildings were much stronger and offered greater protection against raiders. Stone castles could survive attacks using fire, although some elements (such as roofs) were still made of wood. Stone walls offered greater protection against catapults and siege engines that were increasingly used in sieges from the 11th century onwards, although they certainly weren't undefeatable. Secondly, stone castles would last for centuries (many of them survive to this day) whereas wood lasted a decade or two at best. And, last but not least, these castles were imposing and monumental buildings that would command huge respect to any noble able to afford them. They became, therefore, the ultimate symbol of wealth and power (both political and military) across Europe. They were also immensely expensive. At a time when an expensive motte-and-bailey castle cost £20 to build, a stone castle could cost £10,000. And they still used timber for roofs and floors, which could rot and burn. 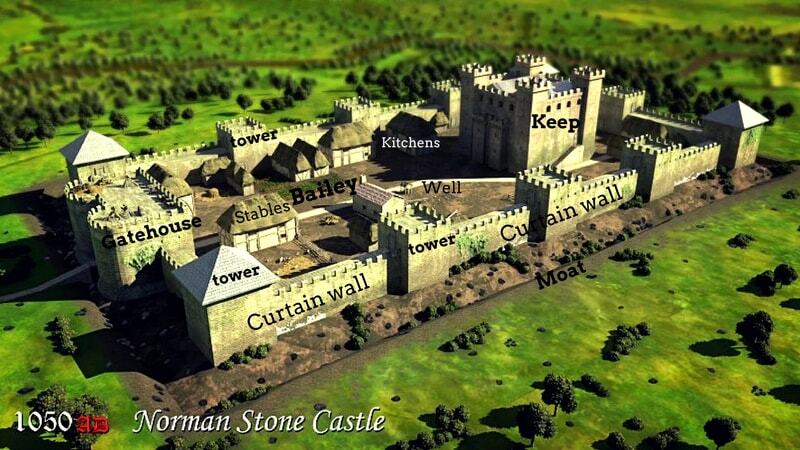 Below is a diagram of the typical layout of a stone castle, though the design depended very much on the terrain. We will be looking at the different parts of the castle as we follow this series.